It is not often that a football team puts 76 points on the scoreboard in a game. It is less often that a football team does so and feels like they lost the game. 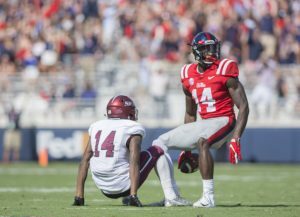 After the 76-41 win over Southern Illinois in which the Rebels gave up more yards than any SEC team ever has against an FCS team, that is exactly what is happening. The Rebels were losing at the half, the offense looks like the best in the nation, the defense looks extremely weak and fans don’t know what to expect. Quite simply, distractions are mounting. To top it all off, it is Alabama week. Matt Luke has a lot to think about at this moment, but first and foremost, he wants to wipe away the distractions and rein the focus in for what is likely the biggest weekend of the season. The adjustments have to be made quickly and solidly if the Rebels have any hope of not being blown out of Vaught-Hemingway. Luke is dead set on adjusting the questionable defense while making sure to keep the offense as hot as it has been right out of the gates and maintaining the general positive mood around the roster. On Monday afternoon, he was quick to take blame for what was lacking in the defense at the beginning of the game so that he wouldn’t create an even more negative feeling toward the defense than is already present. Focus is king going into a game against a titan like Alabama football, and above all else, that is what Luke is preaching to his guys and his fans. Luke, and everybody else, recognizes that any lapse in focus can mean a swift end to the game when it comes to facing the Crimson Tide, no matter what stadium the game takes place in.